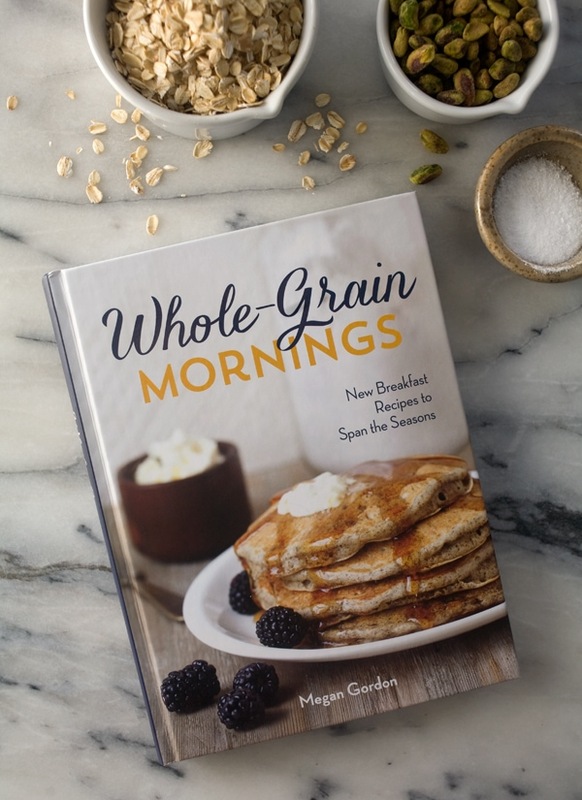 As I was sifting through the book, there were so many delicious, warm and cozy breakfast dishes that I wanted to try, but I figured why not make a granola recipe. 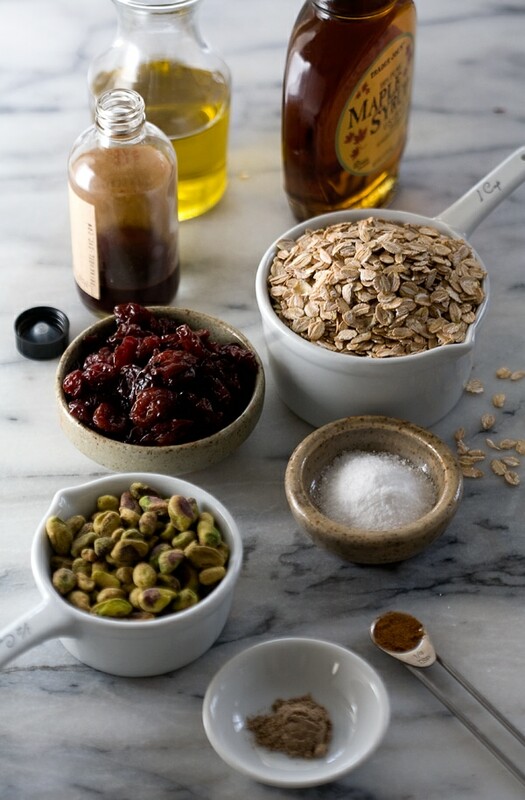 The recipe in the book is called “Make-Your-Own-Signature-Granola.” I love recipes that allow me to add what I like. I actually like restaurants that give me the option of customizing, too. In college, the only decent restaurant in town was Macaroni Grill and I loved nothing more than being able to customize my own pasta dish. I always felt like I could make better combinations than them anyway…mainly because I’m a brat. 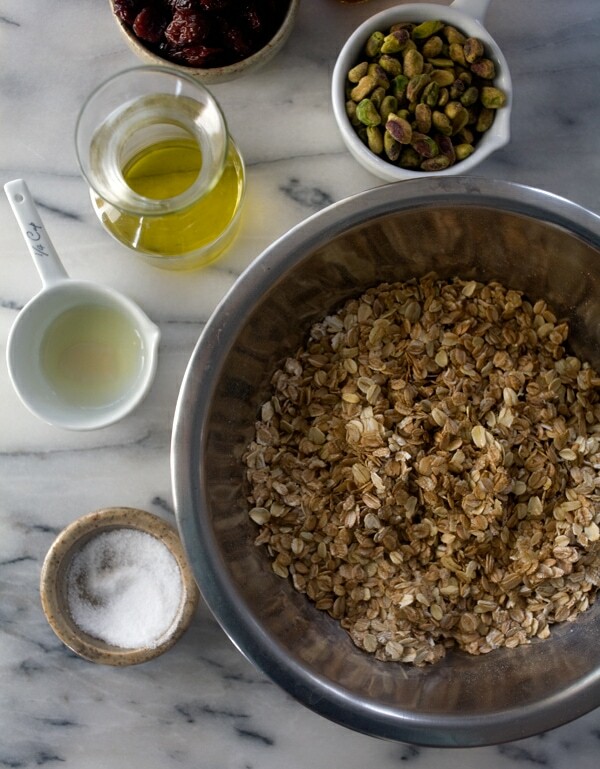 The base recipe for this granola is keeper! The sweetness is absolutely perfect. I love the addition of more cardamom than cinnamon and the saltiness! I love a saltier granola. Megan adds good tips in the book about achieving perfect granola that I think are just great. This is the first time I’ve ever made granola with maple syrup and I just love it. I might actually never go back to using sugar ever again. Oh and just a heads up, I added the pistachios last rather than with the oat flakes (as directed by Megan in the book) because I think pistachios are the only nut that tastes better not toasted. If you decide to go with another variety, like almonds or pecans or walnuts, you should add them with the flake and spice mixture. Here’s to healthy and beautiful mornings in 2014. It feels good to be back. Preheat the oven to 300 degrees F. Line a 13 by 18-inch baking sheet with marchment or a silicone mat. Mix the rye flakes, salt, cinnamon, and cardamom together in a large bowl. Stir to combine. Add the oil, maple syrup and vanilla and stir again to combine fully. Turn the granola out onto the prepared pan and spread in an even layer. Bake until the mixture is light brown and fragrant, 20 to 30 minutes, stirring every 10 minutes or so to make sure the granola cooks evenly. Remove from the oven and let cool completely on the pan. 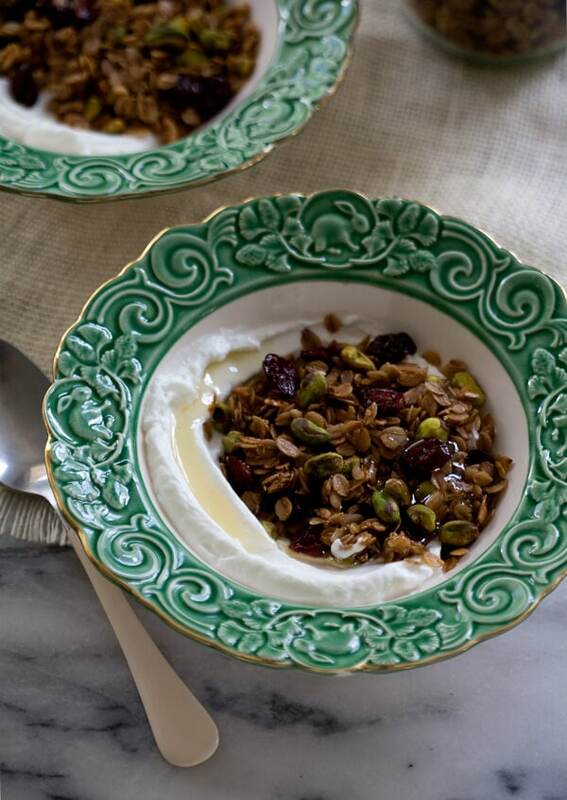 Stir in the pistachios and dried sour cherries. Store in an airtight container at room temperature for 3 to 4 weeks or in the refrigerator for up to 6 weeks. The granola also freezes beautifully for up to 3 months. These pictures are amazing! They really look beautiful! Have a wonderful day! The addition of sour cherries has to be the BEST granola add in. I adore the tartness and chewy texture of these little bombs. I might be a sweet tooth but I sure could make the time to make this. You are doing better than me (I admire you will power); I have no intention of being healthier this year, maybe because I know I will always break it. Have a great new year 2014!!! Oh that sounds great. I love the flavor of honey, so I should give that a whirl next time. I’ve heard so many good things about Megan’s granola recipes and this one seems to be no exception! That pistachio+cherry combo is calling my name. Seriously, you are the queen of rye. 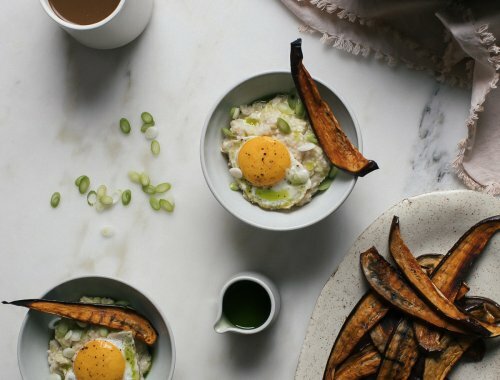 I love it–it’s definitely a grain I want to cook/bake with more often! I’ve heard wonderful things about that cookbook, might just have to treat myself to a copy! This granola looks killer! 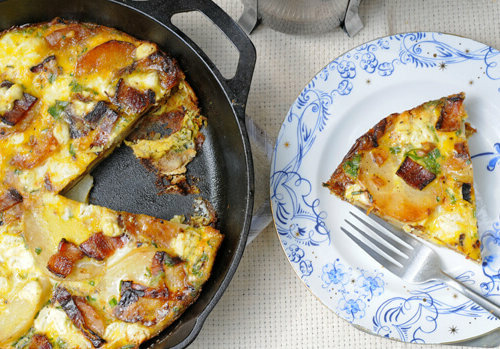 Love the pistachios in there! pistachios and cherries are a match made in heaven! This granola seriously has my name written all over it. This granola sounds fabulous! I would be the one sneaking handfuls out of the jar for random snacks. 🙂 Hooray! I’m so glad that rye is carrying in into 2014. Delish!! Are those salted or unsalted pistachios? I can’t get enough granola these days and this looks like a great new recipe to try! Oh, this looks soooo tasty! Love sour cherries in just about anything I can add them to. When you say rye or oat “flakes” are you referring to rolled rye or rolled oats? Rye granola. This is absolutely amazing and I can’t wait to make it. Megan’s book seems to be really great. Have to get her book soon. Oh my! I just made this for a client yesterday and it turned out so tasty I’m going to have to make a batch for myself this weekend!! YUM. I know you posted this a while back but I just found it now. My daughter has found a love for the sourness of rye bread which I have always loved myself. 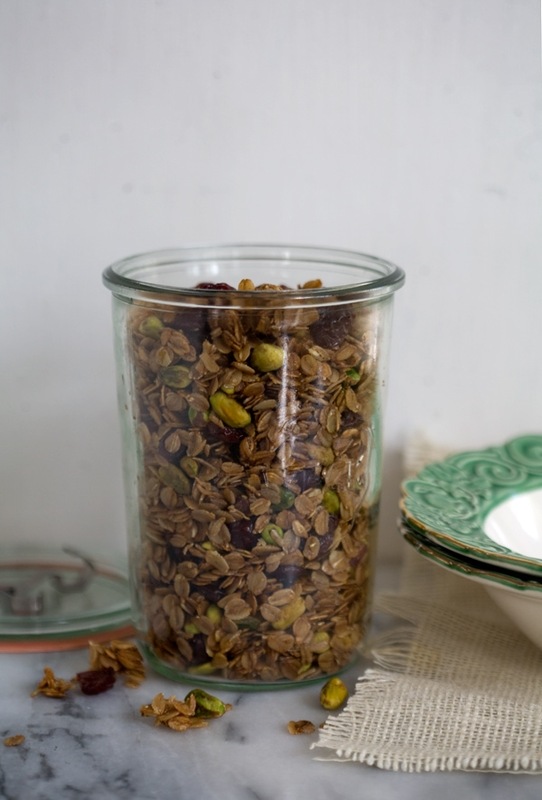 So, to find a rye based granola with my favorite spice – cardamom – I had to try it. It was surprisingly difficult to find rye flakes near me. How crazy is that? I could have ordered them from Amazon but the price seemed so high compared to what I pay for oats. After visiting a minimum of 5 different grocery stores, I found them at a whole foods market for a whopping .89 cents a pound! Wow, cheaper than oats! I also used slightly less than 1/2 cup of maple syrup and it seemed to be plenty. Rolled rye was a little more dusty looking than oats and seemed to go in the oven looking lots more gloppy. However, it crisped up quite nicely after 30 minutes. I have found that using maple syrup as the sweetener is always a big hit with people. I had some friends hooked on a maple coconut granola for some time. One friend’s husband used to pout when she didn’t always have a fresh batch on hand! LOVE maple! The recipe turned out great! I love the combination of these flavors and I do think the rye flakes makes a big difference. I added at least double the cardamom and I think the salt was right on the line of being too much. I did try to be a little stingy on that to begin with so next time I think I’ll go with just 1 tsp. 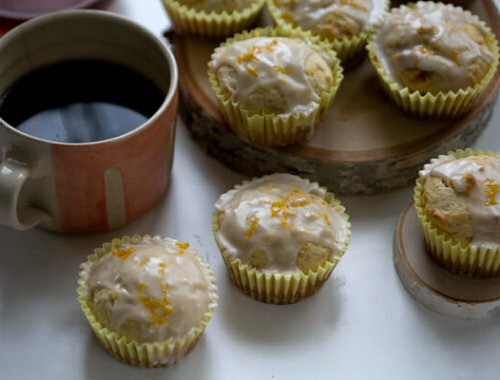 Great recipe here, thanks for posting!